When you’ve gone to all that trouble to organise your traditional Christmas dinner, why use packaged stuffing? It only requires a little more effort to make your own, much more flavoursome and fresher version, so definitely worth spending time on. 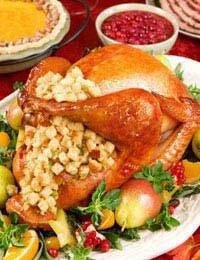 However perfect your main dish is on Christmas Day, a homemade stuffing helps to give it special character. The following recipe suggestions are not expensive or difficult; but once you’ve made your own stuffing, you’re unlikely to go back to the packet! Serves 4 and is especially good with chicken, pork or goose. That’s it! Use as required to stuff a joint or roll into balls to serve separately. For a meaty stuffing, just add 225g sausage meat and omit the herbs if you prefer. Serves 4 and is very good with turkey. Gently fry the mushrooms in butter with the onion, bacon and lemon juice. Lower the heat, cover the pan and cook until the onion and mushrooms are soft. Remove pan from heat and mash the mushrooms. Place the breadcrumbs in a mixing bowl then add the mushrooms and other ingredients, mixing them well as you do so.Add the beaten egg yolks, a shake of salt and black pepper. Use as required. This is great with goose and duck, but double these quantities for goose. In a small pan, simmer the onion and sultanas together in the cider for about 15 minutes, or until the cider has been absorbed.Mix the contents of the pan with the other ingredients before binding with the beaten egg. Season as desired and use as required. Leave the apricots to soak in the wine overnight then drain them when you are ready to make the stuffing. Keep the wine though!Finely chop the apricots. Gently fry the onion in butter to soften it. Use a mixing bowl to combine all the ingredients - including the used wine. All that's left for you to do now is check out the timings for your turkey!